Situated just below the equator in the South Pacific, Papua New Guinea is one of the top dive locations in the world. The best way to experience this underwater world is to dive off live-aboards, which are able to access even the furthest reaches of the islands. Many dive destinations around the world offer sheer walls, drift dives, large pelagics and colorful soft coral growths. But it is Papua New Guinea where the adventure is enhanced by the excitement of diving so far from civilization. Papua New Guinea is located north of Australia at around 6 degrees below the equator. The best diving surrounding New Britain Islands in the Bismarck Sea and in the Huron Gulf off Lae. Port Moresby is the major city and site of the international airport. The best diving surrounding New Britain Islands in the Bismarck Sea and in the Huron Gulf off Lae. Port Moresby is the major city and site of the international airport. Air Niugini serves the major cities within Papua New Guinea with routes from Sydney, Brisbane and Cairns Australia, Singapore, Manila and Hong Kong in Asia and Honiara and Vanuatu in the South Pacific. 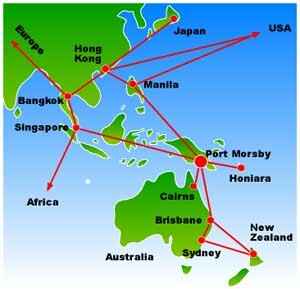 All flights enter the country through Port Moresby except for one route between Mount Hagen and Cairns, Australia. Discover The Pacific Pass, allows any 4 flights and costs US$199, check with local travel agents. Departure tax is K$15 payable on departure. In the U.S. contact Kerry Byrd, Air Niugini, 714-752-5440, 5000 Birch St., Suite 3000 Newport Beach 92660 and Intraozzie Tours 800-531-9222, contact Ms. Chris Bedard for international flights. Morobe Tours will arrange for local ground transportation in the Lae area, POB 320 Lae, Papua New Guinea, phone: +(675) 425-692, fax: +(675) 422-455. It is warm and humid year-round with an average temperature of 28C; water temperatures average 26-28C. September to December tend to be the drier months and better months for diving. Dress is causal and lightweight except in the Highlands where a sweater is recommended for cool evenings. 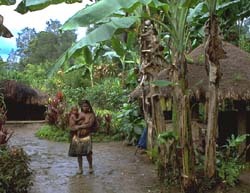 English is spoken throughout Papua New Guinea, with many of the locals also speaking PNG pidgin. Papua New Guinea dollars are called kina ('keen-ah') and are divided in 100 toea ('toy-ah'). Both names come from traditional shell money. The K20 note features an illustration of the most valuable of all village animals, the pig. The bank in the Port Moresby airport will exchange foreign currency and traveler checks. Only exchange the amount you plan to spend before you leave as it is difficult to convert Kinas outside the country. The live-aboards of Papua New Guinea are among the best equipped in the world—bringing a high standard to diving to the adventurer that seeks an almost unlimited warm-water, high-vis experience. For the underwater photographer and videographer, most of the boats provide presentation facilities and some offer E6 processing. After a finely crafted meal, what better way is there than to enjoy the rewards of the day's adventures than from the comfort of the ship-board lounges. As Nitrox grows in popularity, more of the PNG boats will be offering this alternative. The Golden Dawn was the first to offer Nitrox and the newest dive boat to enter PNG waters, the Paradise Sport and the Star Dancer both provide Nitrox. With so much fabulous diving, how does one choose between the nine PNG live-aboards? You can select from the very small and personal charters of the Barbarian, Manta and Chertan to the three-story 39-meter Melaneasian Discoverer catamaran. If you crave daily laundry service choose from the FeBrina, Star Dancer or the Paradise Sport. The best way to choose is to select any of the live-aboards that will take you to a part of the Papua New Guinea underwater world you have yet to experience. But in the end, it is really the adventure that drives our decision not the live-aboard features and luxury. But what the heck, why not have that too! This area is known for its wide diversity of hard and soft corals, huge sea fans and rare species of exotic tiny reef fish that is seldom seen in other parts of the world. East Cape, Banana Bommie, Hammerhead Reef, Doubilet's Reef, Deacon's Reef, and Calypso Reef are just a few of the dive sites that are frequented. Wrecks of B17 bomber Blackjack and the S-Jacob can also be visited. Eastern and False Passages are two 100-foot-wide cuts in the Milne barrier reef with large sea fans, crinoids, abundant soft corals, grey reef sharks, Queensland groupers and schools of unicorn fish and Bumphead parrotfish. Several live-aboards are available for this area including the Chertan, Tiata, Paradise Sport and the Barbarian. Diving in this area includes Kimbe Bay, the Fathers and Witus. Recent marine surveys in Kimbe Bay have recorded over 350 species of reef building corals, and over 900 species of fish, making this one of the richest marine environments in the world. Kimbe Bay diving is protected with numerous and diverse species of spectacular corals, reef fishes and invertebrates, including many which are rare or even yet to be identified. Emma, South Bay, Inglis Shoals, North Emma, Christine's, Susanne's and Restorf Island are only a few of the more than 200 reefs. Fathers Reefs diving has striking reef and coral formations, many reef species including pelagics and an abundance of invertebrate life. Witu Islands are an island group surrounded by a large number of sea mounts and walls with an abundance of marine life. Other areas include Arawe Islands, on the south side of New Britain Islands, which is an excellent haven in the even of monsoon winds blowing out the diving on the north side. D'Entrecasteaux Reefs, south of the Trobriands, are virtually unexplored and this is probably the most pristine diving of the area. Tufi Reefs are renown for great encounters similar to Kavieng, with fairly strong currents constantly flushing the reef with nutrients. Several species of sharks may be seen on a single dive. Other dive sites include Bangkok Pass, Action Pass, Elizabeth Reef and the ocean walls of Bainings region on the North Coast of New Britain. Big pelagics such as eagle rays and schools of hammerhead sharks are routinely seen. The FeBrina has been diving this area for many years and Skipper Alan Raabe and crew can find the hard-to-find reefs. 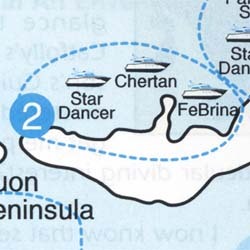 The Star Dancer, Manta and sometimes the Chertan have charters in this area. Kavieng, only one degree south of the equator, affords some of the most exciting diving and is one of the least visited area of PNG. 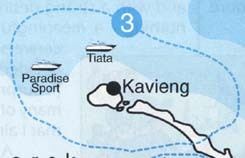 The Kavieng harbor has three world-war II plane wrecks. Dive sites include Big Fish Reef, Eagle Ray Passage, Turtle Reef, and Silvertip Reef. The area is less protected with generally stronger currents, specializing in pelagic fish such as various shark species and rays. New Hanover, west of Kavieng, has large numbers of silvertip sharks and huge schools of barracudas and jacks. Dive sites include Silvertip Reef, Albatross Channel, Big Fish Reef and Byron Straits. A small encrusted submarine is also available for divers. Several of the boats including the Tiata, FeBrina and Mike Ball's new Paradise Sport are exploring the waters between New Ireland and New Hanover islands. Dive along the Gazelle Peninsula south of Rabaul or on some of the 64 ships that are located within Simpson Harbour. Rabaul is location of the world's largest single concentration of WWII wrecks. The Duke of York Islands, midway between New Britain and New Ireland, offer some of the best reef diving in Papua New Guinea. Whales and other marine mammals are common sights in the islands. These islands are only accessible by live-aboard or on special day departures during exceptional weather. 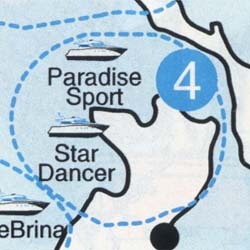 The Star Dancer will specialize in diving the waters and reefs surrounding the Gazelle Peninsula. Madang is north of Lae and to the west of New Britain Island at the mouth of the Sepik River. 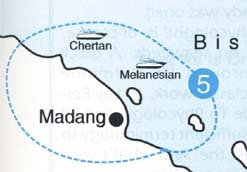 In addition to several shore operations, the Melanesian Discoverer has a four night trip to dive the reefs in this area. Dive sites include Magic Passage, the Bomber, Hole-in-the-wall and the USS Boston. Magic Passage is an area with enormous schools of Garanix Sexfasciatus. These silvery jacks form an immense wall around divers as they hang suspended in the passage. The large numbers can create a rhythmic drumming with their tails that is clearly heard underwater. 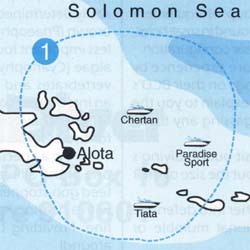 This area includes Finschafen, Siassi Islands and Tami Island to the north-east and Sammaua to the south. This is the specialty of Rodney Pearce, owner and skipper of the M.V. Barbarian, who has been diving the PNG waters for over 30 years. Travel east with Rodney to the evocative Tami Islands famed for their handmade wood carvings. Maybe the most beautiful South Pacific lagoon, Rodney never ties of leading new divers to witness the brilliant sunsets from Tami Lagoon. Dive around the Siassi Islands amongst the huge pelagic fish including gigantic dogtooth tuna. 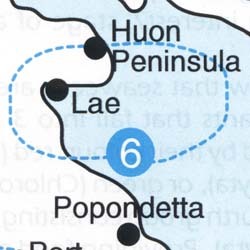 To the south of Lae in the Huron Gulf, halfway between Sammaua and the town of Lae on the mainland, is a ridge of deep dive sites known as Halfway Reef. With no above water reference points, this coral growth rises out of the deep to within 30 meters of the surface. Adorned with large soft corals of purple and pink, very large lion fish can be easily found among an assortment of anemone fish. The northern reef of the Coral Sea is called the Eastern Fields. 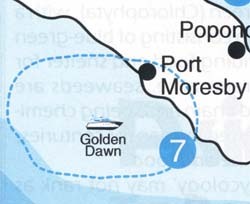 The Golden Dawn is the only boat which visits this area approximately eight times per year. Taking only a maximum of ten divers means only 80 divers per year can witness this remarkable area. Uncountable species of soft and hard corals, and thrilling drift dives with silvertip sharks and hammerheads are only part of the area's diving opportunities. A stop at Carl's Ultimate, named after Carl Roesseler of Sea&Sea Travel, is a must. 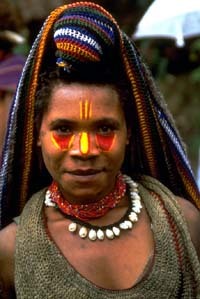 Papua New Guinea has several areas known for their handicrafts. Some of the best wood artifacts can be found at Tami Island known for having the best woodcarvers. Buying artifacts outside of retail store sometimes are offered with "first price" and you are expected to ask for the "second price" which is what the vendor believes the goods to be worth. There are few good restaurants outside the major hotels. The Lae International Hotel has a good one but can be pricey. Lae International Hotel is one of PNG's first class hotels featuring 100 air-conditioned deluxe rooms with private bathroom. Rates range from K$145.00 single, K$160.00 double and K$175.00 for a suite. POB 2774, Lae, Papua New Guinea, Tel: 675-42-2000, Fax: 675-42-2534. 11-night cruise (9+ dive days) from $3,400, Special charters to Trobriand Islands, South New Ireland and the Louisiade Archipelago. 40-meters long, newly refitted interior, laundry service, 16 divers, 3 queen-sized cabins with private facilities, 4 twin-sized cabins with hand basin and share facilities, 6-12 day excursions, $250-280 per person/night , A limited number of exploratory trips to Tufi, D'Etrecasteaux, and Arawe, E6 processing, camera table on back deck area. 13-meters long, steel-hull vessel with rosewood superstructure, Small personal diving for groups of up to 6 divers, Most affordable dive package at approx. $218 per diver/day, Special charters to Tami Island, home of the best PNG wood carvers. Northern Coast of New Britain from Walindi to Rabaul.